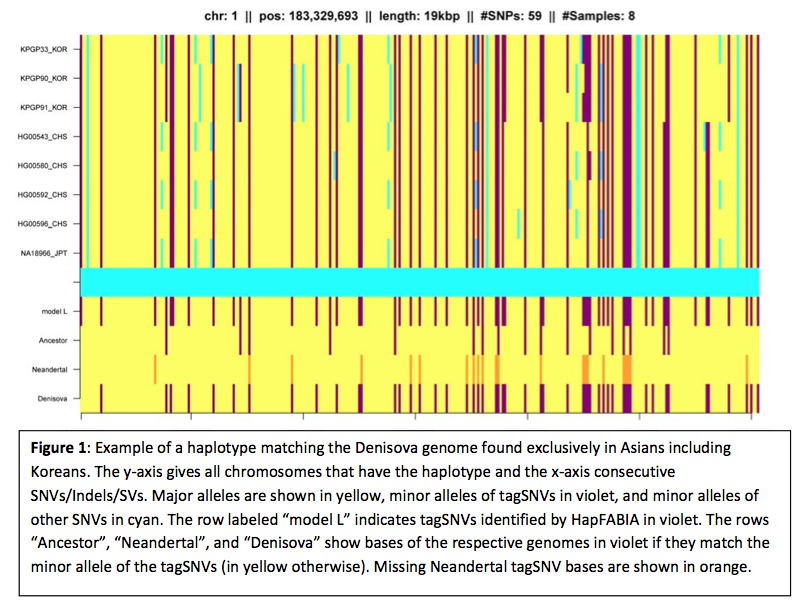 Rare Haplotypes in Koreans: Evidence for a Back Migration into Africa? Browse: Home » 2012 » September » 11 » Rare Haplotypes in Koreans: Evidence for a Back Migration into Africa? These days you never know where research related to modern human origins will be reported and published. Here is a presentation from the Critical Assessment of Massive Data Analysis (CAMDA) conference held in Long Beach, California, on July 13-14, 2012. The team focused on chromosome 1 and used a Korean panel to identify 107,473 haplotypes in Africans, 9,554 in Europeans and 6,933 in Asians. The results are preliminary but nevertheless intriguing. Despite the fact that Africans are by far the most polymorphic, it is Asian rare haplotypes that have better matches with Neandertals and Denisovans. In some cases African haplotypes have their exclusive Neandertal and Denisovan matches, which may indicate a migration from Asia to Africa. 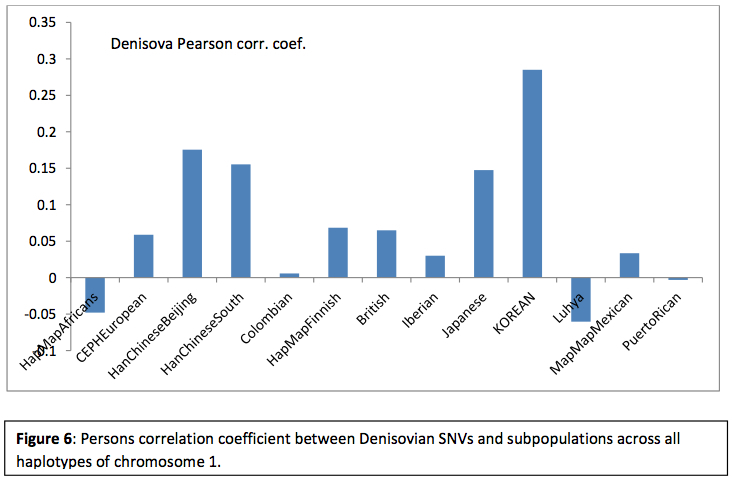 It is interesting that Asian populations seem to have differential affinities with Denisovans and Neandertals and this division may lie along a north-to-south axis. 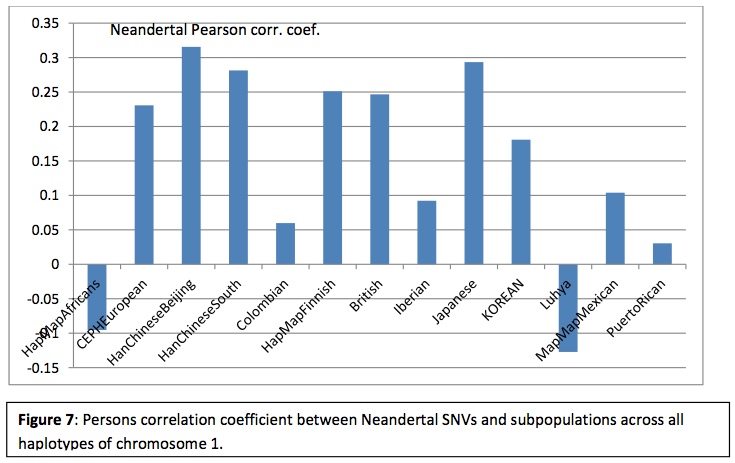 American Indian populations are apparently represented by “Colombians” and “Mexicans,” and these populations are not as enriched with Neandertal and Denisovan single nucleotide matches as other European and Asian sequences but the markers from both archaic species are present in them nonetheless (see below). This is consistent with a bulk of cultural evidence pointing to American Indians being widely represented in both “Northern Eurasian” and “Indo-Pacific” clusters of features.